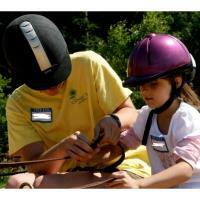 Kensington, NH - The Carriage Barn Equine Adaptive Therapy Programs is looking for volunteers to assist with Therapeutic Horseback Riding & Carriage Driving, Fundraising, Events, and Fun Activities. Volunteers are needed at various times throughout the week to work with horses and clients. Teens, adults and retirees welcome (volunteers must be at least 14 years old). Experience and horse knowledge is a plus, but not required. Are you a student with a community service requirement (Honor Society, Scouts, 4-H, Graduation, etc)? If so, we would love to hear from you! Anyone interested in learning more can contact The Carriage Barn at 603-378-0140, email carriage-barn@comcast.net, or check out our website at www.carriage-barn.org. The program offers services in Kensington, NH and seeks to promote the health and well-being of individuals of all ages with disabilities by enhancing their physical, psychological, cognitive and emotional healing and strengthening through equine activities. The Carriage Barn is a 501c3 Not-for-Profit Organization, as well as a member center of the Professional Association of Therapeutic Horsemanship, International.